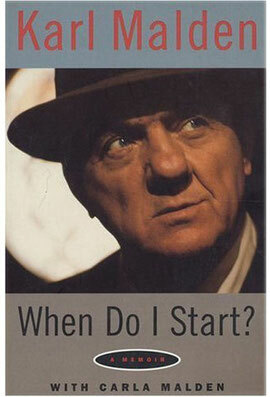 Das Buch "When do I start?" erschien 1997. Es wurde sogar zu Anfang noch in einer limitierten signierten Version vertrieben. Der Erfolg war so gross, dass man es nochmals 2004 in einer Limelight Edition nachlegte. Die ist ein wunderschönes Buch mit vielen Bildern. Informativ und überrascht mit vielen neuen Episoden aus seinem Leben, welche wir an dieser Stelle auszugsweise vorstellen. Und ich kann versprechen, dass einige ganz interessnte Geschichten gibt, die nie den Weg über dein Teich zu uns gefunden haben. Die Autobiographie liest sich sehr unterhaltsam und kann nur jedem Fan ermpfohlen werden. Das Buch ist also in Ich-Form geschrieben. Das macht es umso wertvoller. Wir können hier also die Geschichte direkt von Karl Malden lesen. Auf ebay oder bei amazon kann man Exemplare immer noch zu vernünftigen Preisen (Taschenbuch oder Hardcover) kaufen. Leider gibt es das Buch nur auf Englisch. This is a wonderful book: nostalgic yet clear-eyed, marvelously informative, frequently insightful, often moving, unfailingly endearing, always interesting, and--best of all--thoroughly entertaining. It's trite to say it, but I literally couldn't put "When Do I Start?" down. 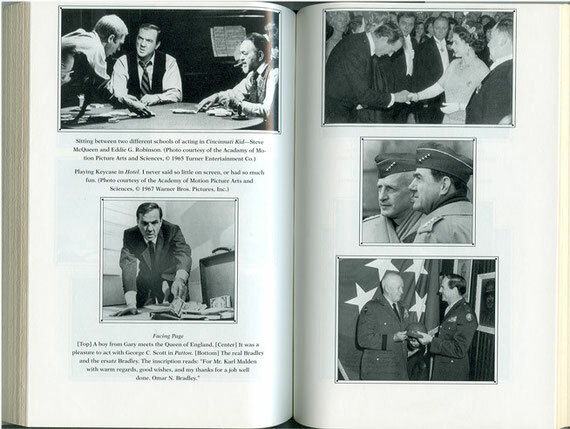 Karl Malden's autobiography is, in addition to being the fascinating chronicle of an all-American life, a veritable between-the-covers film festival: It overflows with intriguing anecdotes--marvelous, revelatory tales of the amazing array of actors, writers, directors, and other assorted characters whose lives have intersected with Malden's over the course of his truly impressive career. But, perhaps best of all, this book clearly speaks in the author's own thoroughly likable, very American voice: It's down-to-earth, always direct, always truthful, thoughtfully considered, admirably reflective, precisely observant, but never, ever, the least bit mean-spirited or egotistical. This is a book--and a man--to love. I don't think I've ever enjoyed a film star's memoir more than this one. I recommend "When Do I Start" as the perfect present for every movie buff, every theatre lover, every TV fan--even every travelers' cheque user--on anyone's gift list. I suspect that even people who've never heard of Karl Malden (can such exist?) will like his book--and I know that everyone who reads it will want to sit right down in front of the TV with a big bowl of popcorn to watch all the videos of Malden's many marvelous films. "When Do I Start?" is a real find and a real "keeper": an admirable, fascinating book by and about an admirable, fascinating man. And oh, yes: It's got lots of great pictures, too!